Sr. Ann Duggan, OSU | Lloyd Maxcy & Sons Beauchamp Chapel, Inc. Sister Ann Duggan, OSU, also known as Mother Cornelius, beloved member of the Ursuline Community, died peacefully Jan. 28th at Andrus, Hastings on Hudson, NY. Visitation will be Friday, Feb. 1st from 3:00 – 7:00 pm. 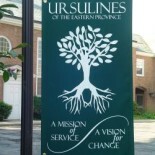 at the Ursuline Province Center, 1338 North Ave, New Rochelle, NY, 10804. There will be a prayer service at 4:30 pm. Mass of Christian Burial will be celebrated Saturday, Feb. 2nd 10:00 am in the Convent Chapel followed by burial at Gate of Heaven Cemetery. Lloyd Maxcy and Sons, Beauchamp Chapel is in charge of the arrangements.